The job market is booming. While this means there are many great opportunities out there, there’s also an increase in the quality of applicants looking to seize these positions. Your qualifications, skills, and experience deserve attention, so how can you ensure that happens, given the fact that most recruiters spend an average of six seconds looking at a single resume? The answer is straightforward: you need a clear, organized resume that presents needed information quickly and doesn’t bog down the recruiter, even if you have a lot to say. Our space-saving resume templates allow you to create such a document without added hassle and stress. This means you can devote more time to preparing for the interview, and you’ll be on your way to day one of your new job sooner. 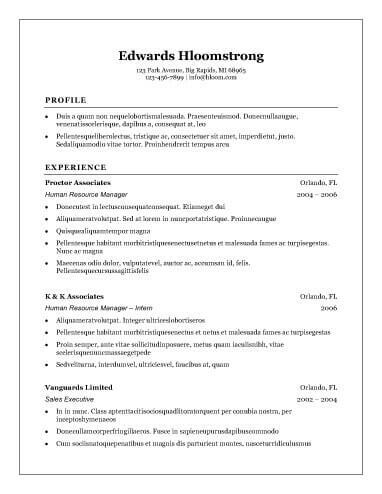 Why Use Space-Saving Resume Templates? Having an impressive amount of relevant experience and skill should be an asset, not an inconvenience. Why spend valuable time trying to determine how to lay out all your information in an appealing one or two-page document when your time would be much better spent on the content itself? When you have a lot of text, it’s sometimes challenging to balance white space, font choice, and indent formatting to give it a professional look. However, if you have several years’ experience, it’s likely more important than ever to present yourself as the professional that you are. Our 10 best resume templates are all professional and time saving to help you put your best foot forward. Having a lot to say doesn’t mean your resume needs to be boring. With these creative space-saving resume templates, your document is sure to catch the eye of recruiters and hiring managers looking to bring a stand-out candidate in for an interview. If you’re applying for jobs in the creative industry, this format may be particularly helpful to you. Especially if you have a lot of text to include in your resume, you may feel like it’s very difficult to create a clean, easy-to-scan document. At the same time, recruiters sometimes need to peruse dozens or even hundreds of resumes quickly, so it’s important that your resume not be overly complicated. Our simple and clean resume templates can help you achieve an appealing minimalist look—while displaying your maximum skills—with ease. With the single-page format, hiring managers are able to print your document and share with a team without worrying about staples, two-sided printing, or pages getting separated. Although the one-page rule no longer needs to be strictly followed in our digital age of electronic sharing, you may find yourself applying for a more traditional position, or you may just prefer concision. 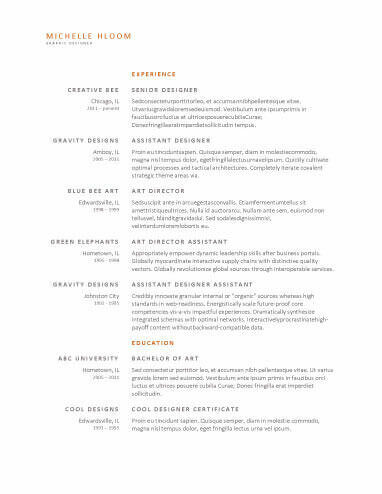 Either way, our one-page space-saving resume templates are a great springboard. The single-page resume format is no longer required. While you don’t want to include distracting filler, sometimes it’s impossible to fit all your relevant qualifications on one page. If that’s the case, it’s better to use one of our space-saving resume templates that spans two or more pages. Peruse our extensive collection of resume templates and examples, and you’ll find formats that will look great as multiple-page documents. Other sections, such as interests and references, are typically optional. Use the following guidelines to help you fill out the mandatory sections. This section should be at the top of your document. It isn’t necessary to include a full mailing address; your city and state can suffice. Use a phone number that you have personal access to at all times, and record a new voicemail greeting if yours is too casual or doesn’t alert the caller to whom he or she has reached. Your email address should be professional. If you’re still using a silly-sounding username, you can easily sign up for a new account with Gmail or other services. The summary statement has generally replaced the objective statement, since your objective is implicit: you want the position you’re applying for! A summary statement should be short—no more than three sentences—and it’s fine to write it in fragments. Include your most important assets and talents. This section works best as a bulleted list, no more than eight items in length. Go back and review the job listing and see if the recruiter gave any desired skills. If you see ones that you have, include them verbatim. This both personalizes your resume to the job and immediately informs hiring managers that you have what they’re looking for. You should aim for a good mix of technical and "soft" skills. Make it easy for recruiters by placing your current or most recent position at the top of this section, and then move down in reverse chronological order. Include position titles, dates, and metrics when possible. Metrics refer to quantifiable accomplishments, such as "secured 12 new accounts for the firm." Along those lines, start each bullet point with a strong verb. This section will include your highest level of education attained. In most cases, this will be your most recent degree. Again, work in reverse chronological order, and if you have professional certifications, list those as well. This is a prime time to get the job you’ve been hoping for. Competition is stiff, and creating an excellent resume is sometimes daunting. All of these features, along with our space-saving resume templates, are assets that work in your favor. You’ll still want to carefully review your resume draft before giving it a final seal of approval. By using a resume builder on top of your own discerning eye, you’ll be well on your way to an interview in the near future.